Timberking sawmills proclaim that they have the “Timberking Advantage” over other portable band sawmill makers. Let's take a look at Timberking and see how these mills stack up against their competitors. All Timberking sawmills come with a four post head, but so do a lot of other brands of portable band sawmills. Having the saw head connected to the bed in four places no doubt does create a very stable platform. This design does have some limitations. The biggest of these is that you are limited to logs that will fit between the posts on the saw head. To their credit, Timberking has built their mills with very large capacities to overcome this issue. Another limitation to the four post design is that, if you have any flex or misalignment on the log deck or bed, the head will cut following that flex or twist, resulting in tapered cuts. Timberking has also overcome this with a heavy duty log bed that is welded together and rigidly built. Having overcome the disadvantages of the four post head design sets Timberking apart from other sawmill competitors. Timberking makes the claim that their direct hydraulic controls will outlast and outperform other brands of sawmills electronic controls. The simple fact is that there is less that can go wrong with hydraulics than there is with electronics, especially on a machine that spends it's entire life outdoors. Moisture from rain and mud can play havoc on an electronic system. Terminals and wires on the electronic boxes corrode and deteriorate very quickly. Hydraulic systems, on the other hand, are virtually weatherproof. UV rays from the sun will gradually break down hydraulic lines over several years, and normal wear and tear will eventually cause seals and cylinders to fail. When this happens, the repairs are generally simple and low cost, while electronics can be complicated and expensive to repair. The large cutthroat on Timberking sawmills is bigger than a lot of other band sawmills. It allows you to cut larger logs without having to turn the log multiple times. At the end of the day it saves time, and whenever you can save time while cutting you can produce more lumber. There is a significant difference between powder-coat finishes and standard paint applications. Many sawmills from different brands are painted bright orange. After a few years, they can fade to a pink or mottled shade that makes it look dated and old. For Timberking models, this is not an issue. The powder-coat finish keeps the color looking the same for years; an old Timberking will still look fresh and new. Overall, the line of Timberking sawmills is one of the best production class portable band sawmills available. 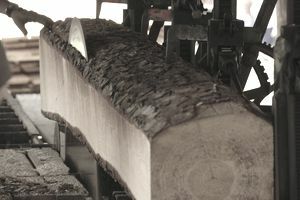 They build a mill with all of the right features that make a good production sawmill. Timberking combines many of the best features in the industry and includes them in all their mills.